ALL-NEW AUDI A3 E-TRON CAN GO THE DISTANCE! Not a big fan of hatchbacks? Fine. How about Sportback? That’s what Audi calls them, as in the A3 e-tron, an all-new hybrid from the German carmaker. It is equipped with a 1.4-liter, inline-4 cylinder TSFI (Turbocharged Fuel Stratified Injection) gas engine that develops 150 horsepower and 184 pounds-feet of torque. The electric motor belts out 102 hp and 243 pounds-feet of torque. Under the rear-bench seat is the 8.8-kWh lithium-ion battery. 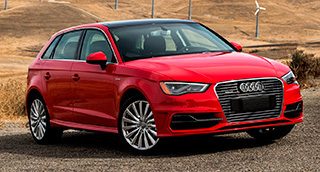 This front-wheel-drive A3 is quick off the mark, lively in traffic and a blast to cruise on the highway. Zero to 60 is possible in 7.6 seconds, achieves 80 mph max EV speed and top speed peaks at 130 mph. It is mated to a slick 6-speed S Tronic auto dual-clutch transmission. Certainly, the coolest cabin trait is the power meter to the left of the analog speedometer showing battery charge, efficiency, percentage of power and boost. This replaces the typical rounded instrument gauges. The battery can be charged by removing the knob in the second of the Audi rings on the front grille. A full charge takes about eight hours on a 120-volt outlet or a little over two hours on a 240 outlet. The A3 can go about 17 to 20 miles on pure electric before the gas engine kicks in. So, for shorter distances, this is your ride, folks. Also, the hybrid plug-in offers a regenerative braking system for additional fuel savings. Otherwise, the interior is classic Audi with stylish jet-engine-inspired circular air vents. The three-spoke, tilt/telescopic steering wheel is convenient for the driver to slip in and out effortlessly while basking in the cozy eight-way leather seat. Don’t let the ultra-thin MMI retractable dash 5.3-inch screen intimidate you. It takes some time but you get used to toggling the knob in the center console for navigation, telephone and radio controls. Other cabin niceties include dual-zone auto climate control, 60/40 rear seat, panoramic sunroof and a driver information center. In the event of a possible collision, Audi pre-sense basic detects an emergency maneuver and prepares the vehicle and its occupants. Dual front and side airbags, side curtain airbag, front knee airbags, Electronic Stability Protection and traction, four-wheel antilock brakes, front/rear parking sensors, rearview camera, tire pressure monitoring system and daytime running lights also are standard. Always fancied that fine German-engineered plug-in hybrid but felt it was out of your pocket reach? Not with the $37,900 base-priced A3. This fresh intro to the Audi lineup is energetic, roomy, nimble and trendy. And a commendable fuel sipper. CASCADA – ENJOY TOP-DOWN MOTORING IN THIS BUICK! The new Buick baby has arrived. No kidding! Known traditionally for its bulky and full-size vehicles, the GM luxury brand has undergone a renaissance of sorts that will continue well into 2018. 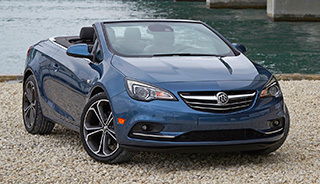 The 2016 Cascada marks the return of a convertible to the Buick lineup after 25 years. Under the hood resides a sole Ecotec 1.6-liter turbocharged inline-4 cylinder, which cranks out 200 horsepower and 207 pounds-feet of torque. That’s more than adequate for a vehicle weighing 3,979 pounds. Power is routed through a smooth 6-speed auto transmission. Available only in front-wheel-wheel drive, suspension is driven by an able HiPer strut independent front and a Watts Z-link rear. An electric variable-assist rack and pinion takes care of your steering needs. Buick has kept the front fascia simple but elegant. Sitting on standard 20-inch wheels is a three-bar grille hosting the familiar Buick emblem surrounded by sweeping LED headlights flowing into the fenders. This being a Buick, you are assured of a luxurious and generous cabin. A 7-inch color touchscreen for audio, navigation and Intellilink readings sits atop the dashboard with a clutter of buttons to operate. Standard amenities include dual-zone climate control, 50/50 rear seat, eight-way power heated front seats, and a three-spoke steering column. Cargo space is 13.4 cubic feet with top up and 9.8 with top down. Safety features include front and rear airbags, side curtain airbag, front knee airbags, StabiliTrak system with traction control, four-wheel antilock brakes with brake assist, anti-rollover bars, rearview camera, remote keyless entry, daytime running lights and tire pressure monitoring system. With a touch of a button, you can open or close the soft power top in a mere 17 seconds at speeds of up to 31 mph. So, if open-air motoring buffs are looking to catch the sun and the eye of the onlookers, the Cascada fits the bill. And best of all, it is a convertible with a Buick tag to boot! That IS250 sport sedan (2.5-liter V-6) is history and ably replaced by an all-new IS200t, which boasts of a wheelbase up by 3 inches and 1/2-inch width increase from its predecessor. But probably the best part is the 2.0-liter twin-turbo and intercooled inline-4 cylinder engine putting out 241 horsepower @ 5800 rpm and 258 pounds-feet of torque @ 4400 rpm. It’s more than enough to take the rear-wheel-drive car from 0 to 60 in 6.9 seconds with top speed at 143 mph. The ride is mated to an 8-speed auto gearbox with eco, normal, sport and snow modes. The F Sport package ($3,545) fetches you a massive mesh spindle grille flanked by twin-projector LED headlights, 18-inch five-spoke wheels, cooled front seats, perforated shifter, black headliner, aluminum sport pedals and a backup monitor. And of course a forceful F Sport-tuned suspension that provides spirited driving. LFA-inspired instrument panel hosts a moving center ring for a digital speedometer, tachometer and a driver information center. Other goodies include silver metallic analog clock, stainless-steel scuff plates with Lexus logo, and a 60/40 fold rear seat and dual-zone auto climate control. A mouse-like, easy-to-use Remote Touch enables the driver to toggle navigation, climate, audio and phone controls, which are displayed on a 7-inch screen. Dual front and side airbags, side curtain airbag, front knee airbags, vehicle stability and traction controls, front/rear crumple zones and side-impact beams, four-wheel antilock brakes with electronic brake distribution and brake assist, daytime running lights and a tire pressure monitoring system are standard. It comes down to choice. If you like a slightly more aggressive ride than the base IS200t has to offer, we recommend adding the F Sport option. It will deliver a punch or two as you ride in style and safety to your destination.